In place of my "17 things over 18" writeup which I used to do for 3 consecutive years during my birthday, I decided to just write 17 things about the way I celebrated my 18th birthday because I just wanted to talk about it some more even if it has been a month already. Little disclaimer: Photo above from my good friend, Marthine. 1. I knew I needed to celebrate my eighteenth birthday this way because I wanted everyone to just come together and celebrate this special year with me. So there, I had (almost) everyone I loved in one room, celebrating with me. 2. 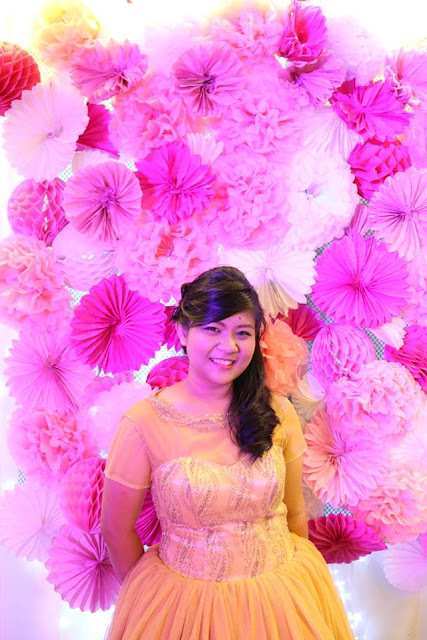 I had my debut party in a small events place in Quezon City, somewhere near the university where I study. They provided the food and setup for the guests seats and the centerpieces so that was less of a hassle with the planning. 3. Speaking of planning, I think the other purpose of this party was because despite the fact that I was soooooo stressed out on doing school work (damn u acads), I still wanted the idea of organizing and planning my own party. I have to admit, despite the stress of managing my school work and organizing this party, I had tons of fun doing it. Deciding for some things and weighing down differences gave me some training on real life keeping track of expenses for my deciding for my own. 4. What made it stressful but fun to do was because it was a huge DIY PARTY! It was a party on a budget that included a lot of trips to Divisoria (which were fun despite the long walks and trips) and Pinterest-ing. I still pinterest even though the event is done though. 5. My cousins were a BIG help on the day of the party. They designed and built my backdrop which turned out EVERY. BIT. WHAT. I. WANTED. (Yes, my backdrop is DIY!) I wanted to give up on it actually since it was really a complicated thing to do. But thanks to my cousins' awesomeness and artsy-ness, my backdrop turned out really well. I didn't get to see it before my entrance to the venue so it was a beautiful surprise upon entering the venue. The paper rosettes/honeycombs/pompoms were bought from party shops in 168 mall in Divisoria. They were hung on plastic chickenwire and placed against the wall. Meanwhile, my chair was borrowed from my aunt's friend. 6. My name: Bought them from Tabora Street, again in Manila, and wrapped them in pink and gold wrapping paper bought from the bookstore. By myself. Yes. I knew I wanted my name on the stage because for god's sake, everyone spells my name wrong. 7. On the color motif and theme: Pink and gold wasn't the first choice. It was vintage in teal and gold actually. But teal was a really hard color to find and use for the invitations, backdrop, and cake so I opted to just go with the very generic color of pink, however placed against an unusual debut color gold. I actually panicked since I was already in the middle of finalizing a lot of things when I realized the theme was almost gone from the atmosphere of the debut but I decided to just brushed it off-- as long as many of the elements in the debut were me, I knew I was in the right track. 8. I opted to just have a two layer cake especially since I didn't really have a lot of guests. The design was based off an existing design that the bakeshop, Merced's, offered. I opted for a chocolate cake, because you'd never go wrong with it. And hell yeah, it tasted superb. 9. I had my gown made in a small shop in Divisoria especially since I knew I didn't want to spend too much on the dress alone. I didn't want to get myself a second dress like how other girls do for their debut parties because I wanted to savour the only time I would get to wear a puffy gown. My friends were carrying my gown behind me while I was gliding around the place like a fluffy gold cotton candy, greeting people during the dinner time. 10. Eitherway, I loved my dress to bits and I made me feel like I was either Belle from Beauty and the Beast (especially since my stylist decided to do my hair in that way) or Cinderella from Into the Woods. 11. I had glittery golden mary jane shoes. I've always wanted mary janes but for some reason, I never really found events to wear such things so finding one that matched my dress was a chance I couldn't miss. 12. Another DIY project in this party was my Invitation and Thank You Cards. My sister, being the layout-photoshop master she is, did the layout of the invitation which made people swoon about the sweet and cute the vibes it sent out upon opening the envelopes. I bought scented envelopes from the bookstore, which I believe made the invitation much prettier. 13. One person greatly responsible for making the party work was my high school friend, Nicole, who hosted the party. I notified her about the job I was letting her do 3 weeks before the debut but she was game, so game she replied with capslocked letter YES-- and I'm tons grateful for that. 14. Eighteen roses? More like nine! Haha! I didn't want to do this either. That is how much of an awkward girl I am, I refused to ask boys I wasn't close with to dance with me in the 18 roses dance. That's the story of how I only had cousins and uncles dance with me on my 18th. 15. Of course, I had a whole bunch of beautiful ladies for the 18 candles I blew on my birthday. Most of them were the high school friends and girl cousins who I thought would be too busy on the day of my birthday ro come over, but still came to celebrate with me. 16. I didn't have a performance for my birthday but my high school friends, after the program proper, took the microphones and sang for me. Crizzel sang The Way You Look Tonight in a capella and it just warmed my heart because no one has ever sang for me-- and it was a first. This was when my friends were making me open a bunch of illustration boards that spelled out their gift which was "Pagmamahal." True to being the corny but sweet human beings they are. 17. Overall, I could say that this party just made me feel how legitimately blessed I am in the eighteen years I've been alive. Despite the fact that I only had a few handpicked guests, I enjoyed their company and the only thing I hope, is that they know how awesome I felt that they too, made someone like me happy.